The government of France, under pressure to balance its budget after the global economic downturn from the bankster scams, has come up with a painless way to do it: tax the rich and corporations. US corporate media will not allow so much as a discussion of this, on their knees as they are before their owners, board members and advertisers to promote corporate greed at any cost to the public interest. “The budget is expected to introduce a fiscal reform taxing capital gains, interest and dividends as regular income, as well as a populist move to impose a 75 per cent tax rate on incomes above one million euros.” This is what we’ve described as true wealth, at LUV News, over the years, primarily in the hands of the 1%. French protesters do like to bring out posters depicting the guillotines of the revolution to remind the rich what happened when the under-taxed reigned before. These protesters point out that the guillotine was kinder than what the royalty did to the peasants, who were subjected to the suffering of a slow death from starvation. Such knowledge is sobering—most wealthy French accept the tax increases as inevitable. It is not difficult to explain why some nations are wealthy and others are poor if one looks objectively at history. It is nonsense to accept the American mass media view that it is because some peoples work harder than do others. Northern India was quite prosperous before the British took it over and forced workers to produce opium, which it traded to the Chinese, addicting them and sending ever more opium into that unfortunate country to enrich the British Empire. Under British rule, every part of India became impoverished. Similarly, wealth was extracted from Africa through European colonialism. 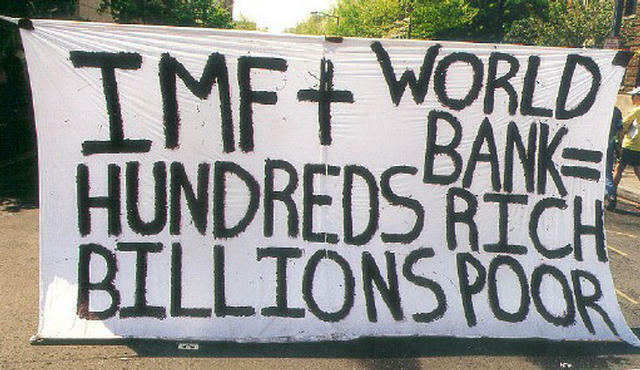 The same may be said of the US Empire, which has extracted wealth from the North American arctic to the southern tip of South America, including the Caribbean, leaving massive poverty in its wake. There are several means, not just military power for doing this, although nations not submitting to US corporate whims have often been attacked, their leadership replaced by sycophants. 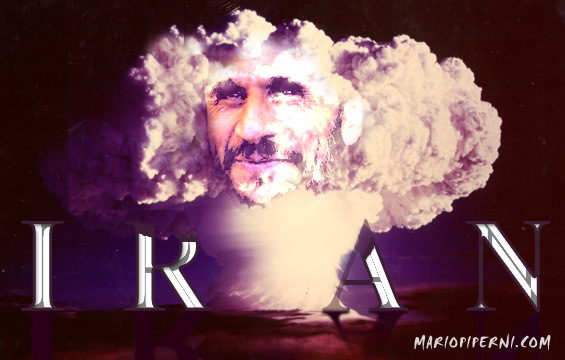 Cuba is still being punished by the US Empire for having the audacity to overthrow its puppet US dictator, Batista. In a UN speech, Bolivian President Evo Morales said, for this, the US is the real terrorist state (Cuban news this morning). 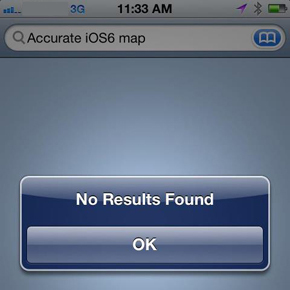 Image via The Amazing iOS 6 Apps. 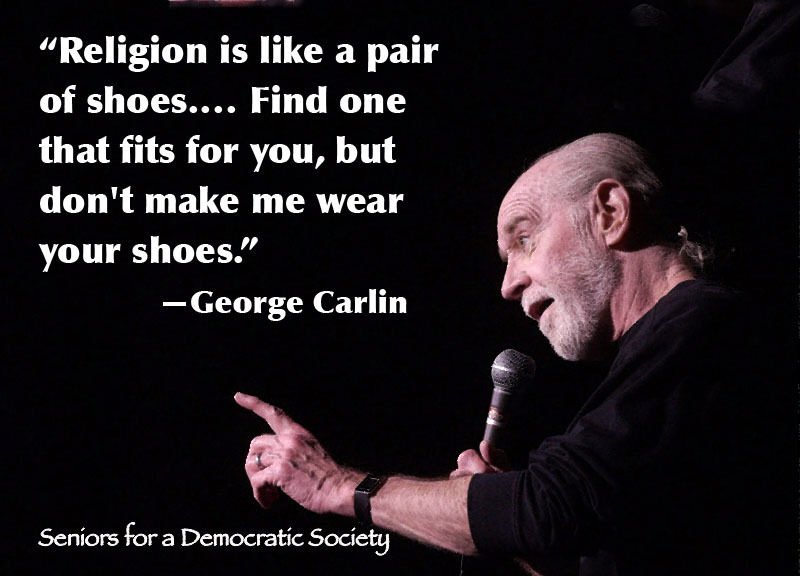 Friday’s collection of the week’s late night political humor from Political Humor will now double as an open thread so feel free to rant or rave about whatever issue, political or not, that’s pushing your buttons. 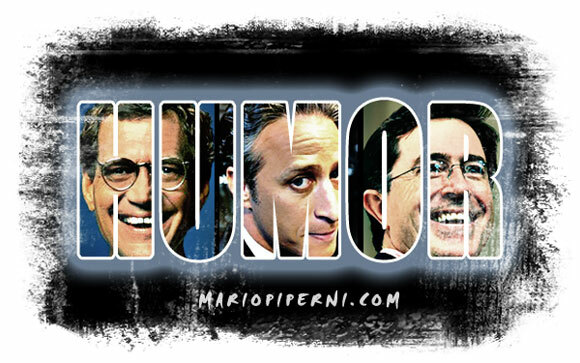 Something about Leno that irritates me and I try to use as little of his material as I can. I’m contemplating banning the weasel permanently from this Friday feature. On June 17, Obama held a slight edge over Mitt Romney among Catholics (49 percent to 47 percent), according to the Pew Research Center. Since then, Obama has surged ahead, and now leads 54 percent to 39 percent, according to a Pew poll conducted Sept. 16. Among all registered voters, Obama leads Romney 51 percent to 42 percent, according to Pew. 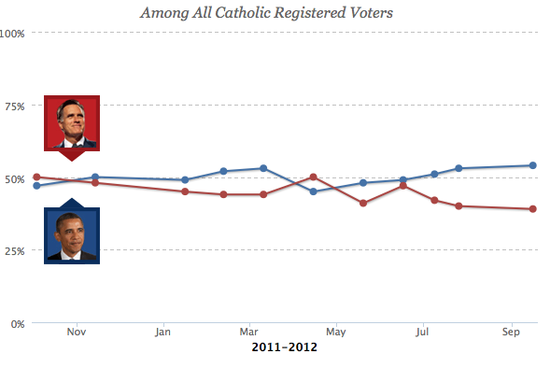 Obama and Romney are essentially tied among white Catholics, which some pollsters call the ultimate swing group. But Obama’s current even status among white Catholics now is an improvement over 2008, when McCain beat Obama among white Catholics by 52 – 47. Obama’s total Catholic vote against McCain was where he is now: 54 percent. But Romney has only 39 percent compared with McCain’s 45. A small word of thanks to Cardinal Dolan, Robert George and K-Lo for helping shift the Catholic vote massively toward Obama with their summer campaign for religious liberty. And special thanks to Paul Ryan. No actual Catholic could ever find anything but puerile cruelty in the works of Ayn Rand, or rally to the idea that home-care for the elderly should be sacrificed to reduce tax rates for the super-rich. 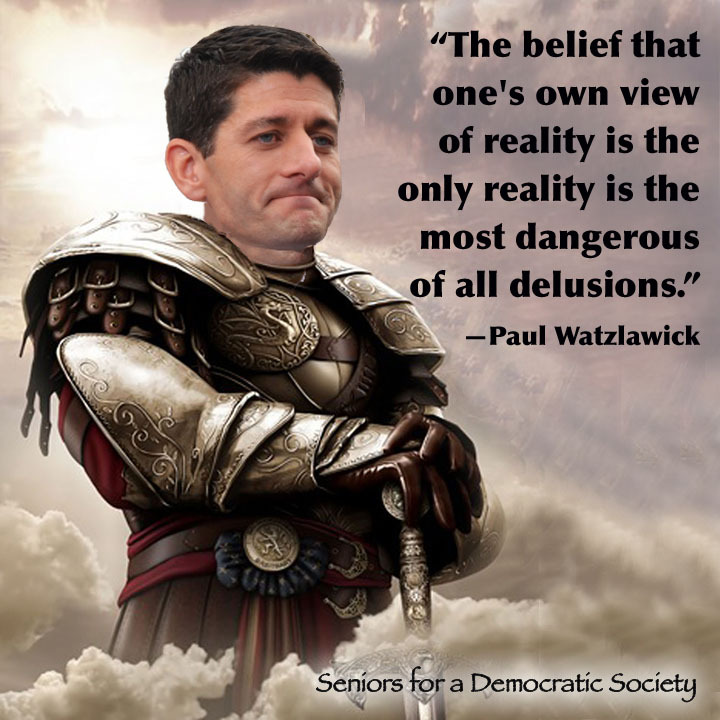 Paul Ryan believes that the basic principles of Rand can be compatible with Catholicism. American Catholics are just not that dumb or confused about their faith. One other small point. The poll, though just released, was conducted on September 16. The polls have shifted slightly in his favor since. The 47 percent tape – about as anathema to Catholic social teaching as is possible to express in its contempt for the poor – cannot have helped. I wonder also about white Catholics and Romney’s Mormonism. There may be some conservative Catholics leery of what some regard as a cult. What delusional crap. There are seven weeks left in the campaign and because we’re talking about politics here, anything can happen. So yes, Romney can still win…but it won’t have anything to do with honing his message. The main reason polls indicate that Romney is losing ground on Obama has to do exactly with the message he and Ryan are pushing – the Republican message. 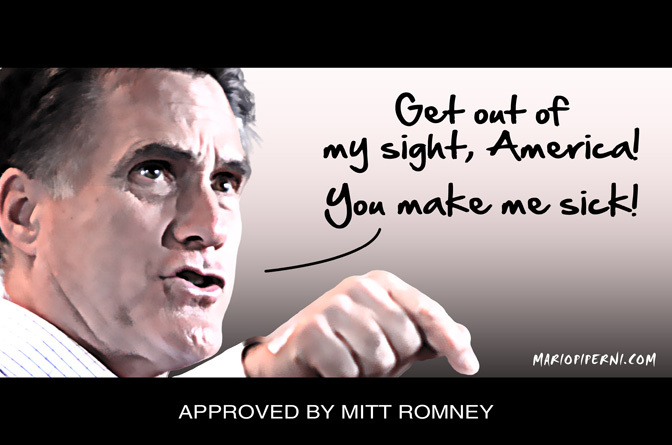 If Romney hones that message any better than he has, then there is NO chance of victory in November for Republicans. The only reason Romney still has a fighting chance in this election is because of the bit of success he and Republicans have had in hiding their true intent. Lies, deceit, voter suppression and a willing conservative media does wonders in masking the truth from low-information voters. Why has Romney not been specific about policy? Easy. Because he knows that should the American electorate ever become fully aware of what Republicans really have in mind for them, this election would have been over months ago. Surprisingly, people like Erickson and other conservatives still don’t get it. They honestly believe that if people really understood what it is that Republicans have in store for them, and given the Obama record over the last four years, a Republican victory would be a lock. There is no denying that Romney is a horrible, awkward candidate but the reason he can be categorized as so is not because he’s not articulating the conservative message as well as Erickson would like him to. 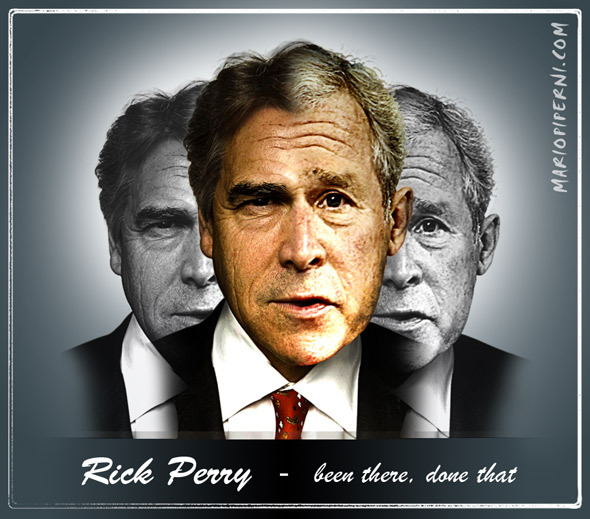 It is because Romney cannot hide the conservative message as well as some other candidate might have done. The video that came out of Romney disparaging half of the population was a serious blow to Republican hopes only because it revealed the party’s true feelings toward the poor, the middle class and every American struggling in difficult times. It revealed that the Republican party is the party of intolerance and divisiveness and, most of all, it revealed that the Republican party truly is the party of the rich, the bigots, the wingnuts and no one else. Not the poor. Not the middle class. Not women. Not the young. Not the old. Not minorities. The problem is not Romney. The problem is an entire Republican party that has lost its way. “Well, not here, ladies; not without your ID!” He demanded their driver’s licenses, but the ten quite elderly Sisters of the Holy Cross, including a 98-year-old, had long ago given up cruising. 15 percent voters with household income under $35,000 a year. …Read the rest in Billionaires & Ballot Bandits: How to Steal and Election in 9 Easy Steps. Trouble’s brewing in River City and it starts with a capital R.
The wheels are falling off the Romney bus as the campaign flounders from one disastrous week to another. It’s gotten so bad that I’m actually starting to feel sorry for Mitt. Check out this clip from a campaign stop yesterday where the crowds chant, “Ryan! Ryan!” which has Romney embarrassing himself in the most pathetic of ways. When Romney feels forced to inform the crowds whose at the top of the ticket, well, he better start hoping that the GOP’s voter suppression effort pays off because he doesn’t have much else going his way. This tidbit from the Politico piece made me smile as it gives greater relevance to an illustration I created last week. Even the lyrics from the Gilligan’s Island theme song applies to some degree. Hey, just got an idea. Let’s have a little contest. 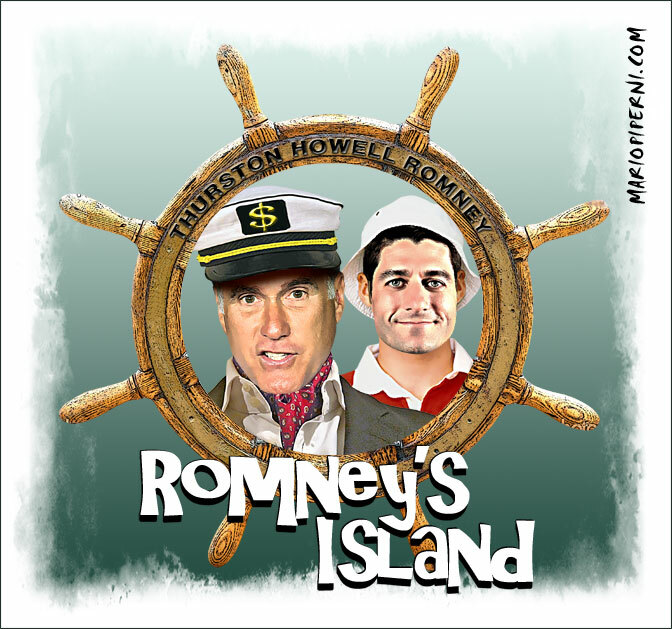 Adapt the Gilligan lyrics to the Romney/Ryan fiasco. A minimum of eight lines is required. 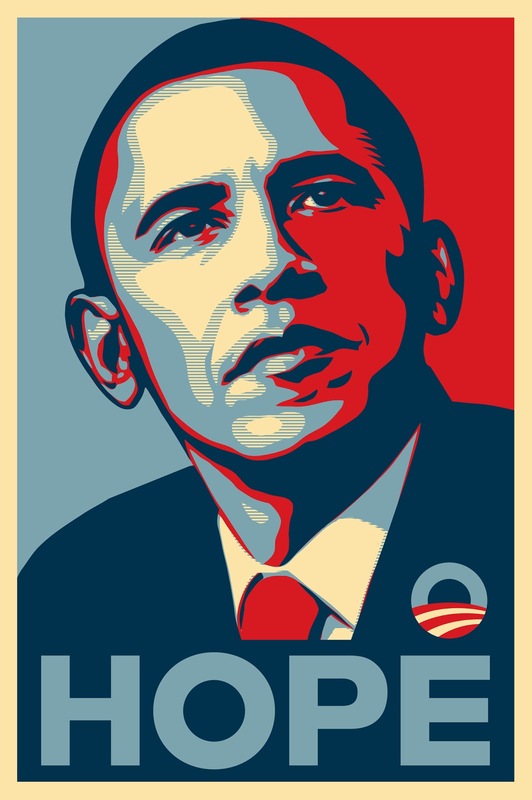 First prize will be a personalized illustration of yourself or anyone of your choosing in the style of the iconic Obama ‘Hope’ illustration. You can find the lyrics to Gilligan’s Island here. Feel free to share the contest with family and friends. If it turns out well, we might have regular contests of this type. So get the creative juices flowing and show us what you come up with. 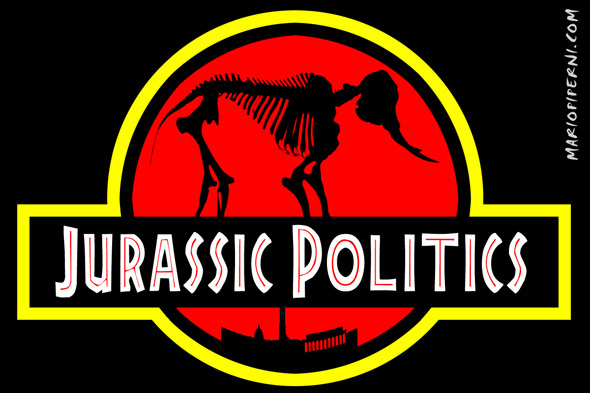 Also, if you have ideas for political illustrations, send ‘em over. If I use it, a personalized illustration or photo enhancement is your gift from me. 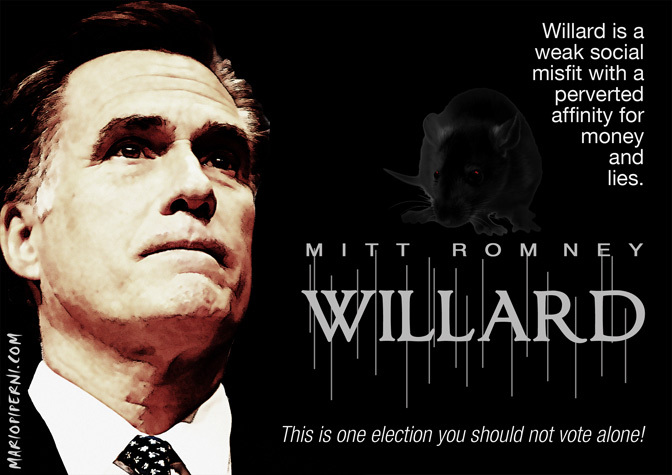 The Willard illustration above was suggested by our one and only, E.A. Blair. He receives a personalized illustration. NEW YORK (The Borowitz Report)—G.O.P. Presidential nominee Mitt Romney finally got some good news today as he found himself ahead of President Obama in a poll of N.F.L. replacement referees. 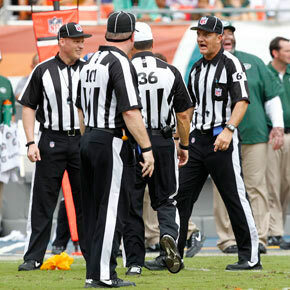 The survey, which immediately lifted the spirits of the Romney campaign, was taken among replacement refs on the field during N.F.L. games that they were supposed to be officiating last Sunday and Monday. According to the poll, if the election were held today the replacement refs would have Mr. Romney beating President Obama by a score of 14-12. Get the Borowitz Report delivered to your inbox for free.